CWLSXTAX2FB: Veris CO2 Wall Sensor, LCD, 0-2000/0-5000ppm measurement range, 0-5VDC/0-10VDC/4-20mA selectable output, temperature transmitter: scaled 10 to 35°C (50 to 95°F), setpoint slider: 10k ohm. Black housing. CE. CWLSXTDX3A: Veris CO2 Wall Sensor, LCD, 0-2000/0-5000ppm measurement range, 0-5VDC/0-10VDC/4-20mA selectable output, 10k ohm type 2 thermistor, push button override, setpoint slider: 1k ohm. CE. CWLSXTDX3F: Veris CO2 Wall Sensor, LCD, 0-2000/0-5000ppm measurement range, 0-5VDC/0-10VDC/4-20mA selectable output, 10k ohm type 2 thermistor, push button override, setpoint slider: 10k ohm. CE. 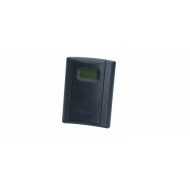 CWLSXTDX3G: Veris CO2 Wall Sensor, LCD, 0-2000/0-5000ppm measurement range, 0-5VDC/0-10VDC/4-20mA selectable output, 10k ohm type 2 thermistor, push button override, setpoint slider: 20k ohm. CE. CWLSXTF: Veris CO2 Wall Sensor, LCD, 0-2000/0-5000ppm measurement range, 0-5VDC/0-10VDC/4-20mA selectable output, 3k ohm thermistor. CE. CWLSXTFX1: Veris CO2 Wall Sensor, LCD, 0-2000/0-5000ppm measurement range, 0-5VDC/0-10VDC/4-20mA selectable output, 3k ohm thermistor, push button override. CE. CWLSXTFX3F: Veris CO2 Wall Sensor, LCD, 0-2000/0-5000ppm measurement range, 0-5VDC/0-10VDC/4-20mA selectable output, 3k ohm thermistor, push button override, setpoint slider: 10k ohm. CE. CWLSXTH: Veris CO2 Wall Sensor, LCD, 0-2000/0-5000ppm measurement range, 0-5VDC/0-10VDC/4-20mA selectable output, 10k ohm type 3 thermistor. CE. CWLSXTHX1: Veris CO2 Wall Sensor, LCD, 0-2000/0-5000ppm measurement range, 0-5VDC/0-10VDC/4-20mA selectable output, 10k ohm type 3 thermistor, push button override. CE.